My collections are designed to work together. Design your own unique collection. Ask me if you need help choosing. I am always happy to help. All my butterflies are designed to display together. With over 100 choices, the possibilities are endless. Mix it up! My prints are affordable so that you can change them according to the season or your mood. Large prints are available. If you need any prints larger than you see available, let me know. I can help you. I received a BFA in graphic design from Florida State University and worked as a graphic designer / illustrator for over twenty years for a long list of leading companies and ad agencies. The past few years, I've been 100% focused on my watercolor painting. My paintings have been featured in multiple magazines including Better Homes & Gardens® publications and is currently licensed to a few manufacturers for their goods. I work in my home studio, a big room that would be the envy of any artist. Depending on my mood, it can take me hours or weeks to finish a painting, and I usually have several in progress at the same time. When I decide a painting is finished, the digital process begins. I scan the painting on a professional scanner and take it into Adobe Photoshop to process it into a digital image for prints. This is the most time-consuming and tedious part. It can take me hours to color correct, by testing each image to make sure the color is the same as the original. When you get a print with a white background, you can be assured the white is the white of the paper of your print. No gray or yellow backgrounds! Just paper! I am very picky so the prints you receive actually look like the original watercolor painting, especially when printed on my high end, museum grade watercolor paper. It takes a better eye than mine to tell the difference and I've had to start writing "original" on the back of my paintings. I manage all orders myself from printing to shipping. All prints and cards are made to order by me. Cards are printed, hand folded and trimmed with a paper cutter, one at a time. My giclée prints are made on an Epson Stylus Pro 3880 that uses archival inks that Epson claims won't fade for up to 200 years. I have spent a great deal of time finding the best paper. I use a Museum Grade 100% Rag Aquarelle WATERCOLOR paper, but it is very expensive! I recently found a less expensive alternative to offer in addition for those who are decorating and price is important. This is currently shown as either MATTE or SMOOTH in my listings. It is also 100% rag and archival, but allows me to offer a little price break. I hope you will join my Collector's Club at http://eepurl.com/bN6ZCj to see new paintings and special offerings on a very occasional basis. I am a full time artist living in Southern California. I have a graphic design background but it's watercolor and illustration that feed my spirit. 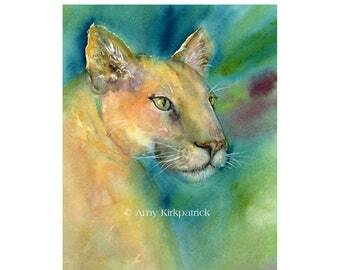 Thank you for visiting AmyKirkpatrickArt. I love sharing my art with you. I am always painting and adding new items so check back often.